Partners from the REDAWN project joined with representatives from industry and other EU project teams including LifeHyGENet, Hidrotor and Life Nexus to discuss innovations from the latest work on harvesting clean energy from water networks. The meeting was hosted by FAEN at the Universitario de Mieres, Spain. This was a fantastic opportunity to share innovations and discuss challenges in our projects which are making important advances in how we can build sustainability into the heart of water infrastructure. The opportunities presented by micro-hydro power are particularly exciting in terms of the potential to harvest clean energy which has up to now been wasted in existing infrastructure. 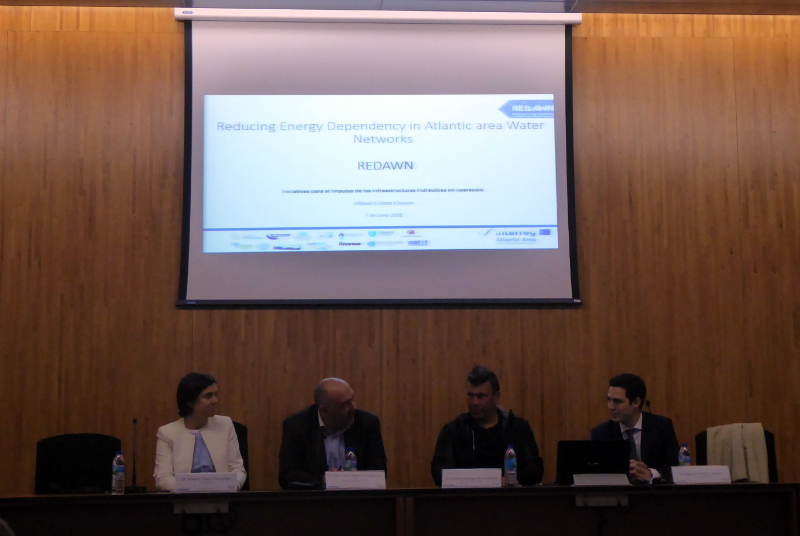 Speakers include Mr. Anibal José Vázquez Fernández, Mayor of Mieres City Hall and Mrs. Belarmina Diaz Aguado, General Director of Mining and Energy, Regional Ministry of Economy and Employment for Asturias. Miguel Crespo Chacón, representing our project partner Trinity College Dublin, gave a presentation on the REDAWN project, giving a general overview of the project and the current and future challenges linked to the water industry. These included, among others, the potential for energy recovery in water networks to reduce energy dependency and barriers which need to be overcome before implementation can be achieved. He discussed Pump as Turbine technology as a viable solution for energy recovery in water networks, the construction of three demonstration pilot plants and what has been discovered so far in terms of institutional, policy and social impacts.